Neofinetia genus has only two species – Neofinetia falcata and Neofinetia richardsiana, whereas only the first one is extremely popular. 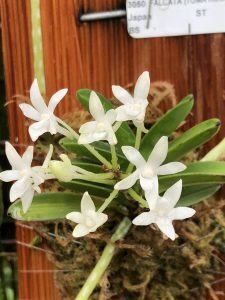 In medieval Japan, Neofinetia falcata was very prized for its elegance, beauty, lovely vanilla scent, and was grown by samurai and even emperors had large collections of rare cultivars of these orchids, so sometimes Neofinetia falcata is called Samurai Orchid. Interesting that its flowers resemble samurai helmet, which is a part of this orchid popularity within Japan. In Japan, this orchid is called Fu Ran, which means Wind Orchid, reflecting its epiphytic nature – in Japan, this orchid species grows on trunks of deciduous trees, in China, it is called Feng Lan. There are numerous named cultivars of Samurai Orchid, some of them are highly prized and could cost up to thousands of dollars, some cultivars are even Japan’s National Treasure and are restricted to leave Japan. 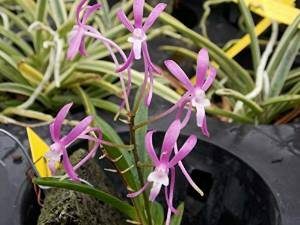 Neofinetia falcata, or Samurai Orchid is monopodial with white, purple or rarely green or yellow flowers (within named cultivars) with prominent spurs. Flowers are fragrant and resemble vanilla ice-cream. Named cultivars with different flower color and morphology, variegated or monstrous are called Fukiran – everything from a plant size, leaves habitus, leaves color, a color of root tips and flower color could vary, therefore it is possible to create amazing orchid collection solely Fukiran. 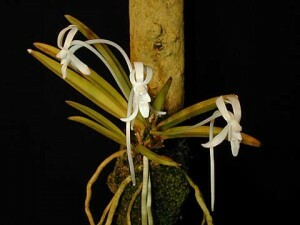 For instance, Neofinetia falcata Orihime has variegated curved leaves, Neofinetia falcata Asahiden has more profound leaves variegation, stems are brown, flowers white. Neofinetia falcata Hokage has irregular yellow stripes on leaves, Neofinetia falcata SHOUJOU*SHUTENNOU has pink flowers, Neofinetia falcata TAIGA has yellow stripes on leaves and pink flowers, and Neofinetia falcata Hisui has green flowers (hisui in Japan means jade). Both Furan and Fukiran are warm to cool temperature orchids, in warm climates best grown in a medium bark. Proper Samurai orchid care includes regular watering after bark becomes dry, bright sunlight at winter (without intense light in winter it wouldn’t be more flowers in summer) and bright filtered light at summer, and balanced fertilizers. There is also Japanese traditional Samurai orchid growing technique in full sphagnum moss.